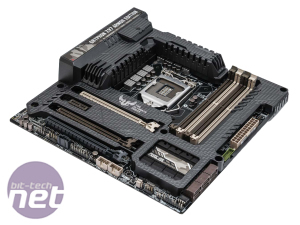 If you know your stuff when it comes to the PC hardware enthusiast scene then you'll have heard of ASUS's TUF range of motherboards before. 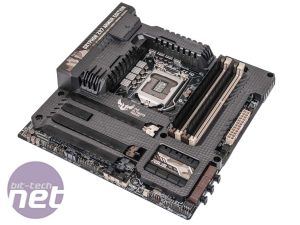 They've been around, at least in ATX form factors, since way back in the LGA1366 days and we were quite taken with them, mainly due to the fact they offered great overclocking potential and above average feature sets. 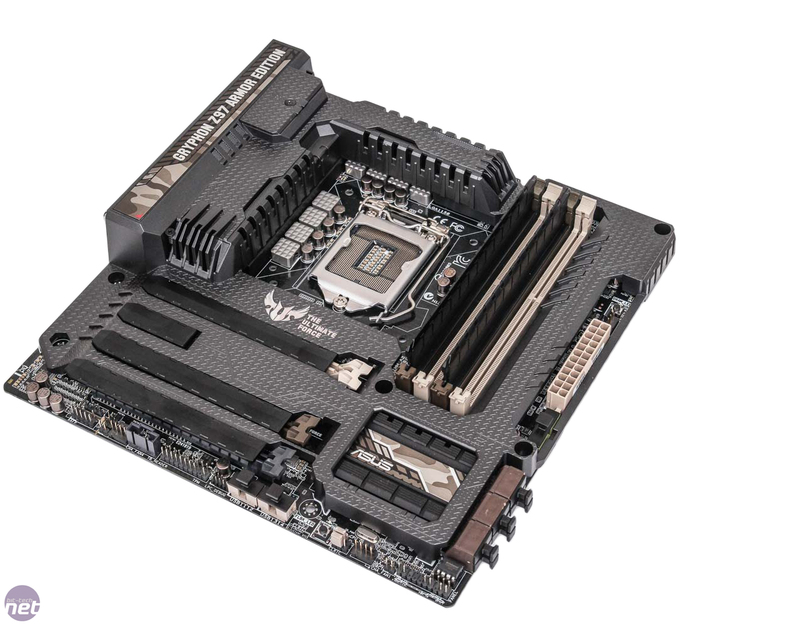 These days, we're not seeing a great deal of variation when it comes to overclocking, especially with Z97 motherboards. 4.7GHz on our Intel Core i7-4770K is the worst we've seen, 4.8GHz the best, so clearly there's little to be gained from investing in an expensive motherboard just for overclocking. Add to this the CPU lottery and it makes even more sense to focus on other things. 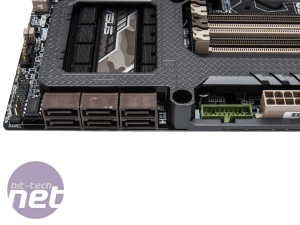 Thankfully, both ASUS's TUF and ROG ranges come bristling with features, many of which are genuinely useful and you may find you use them regularly too. 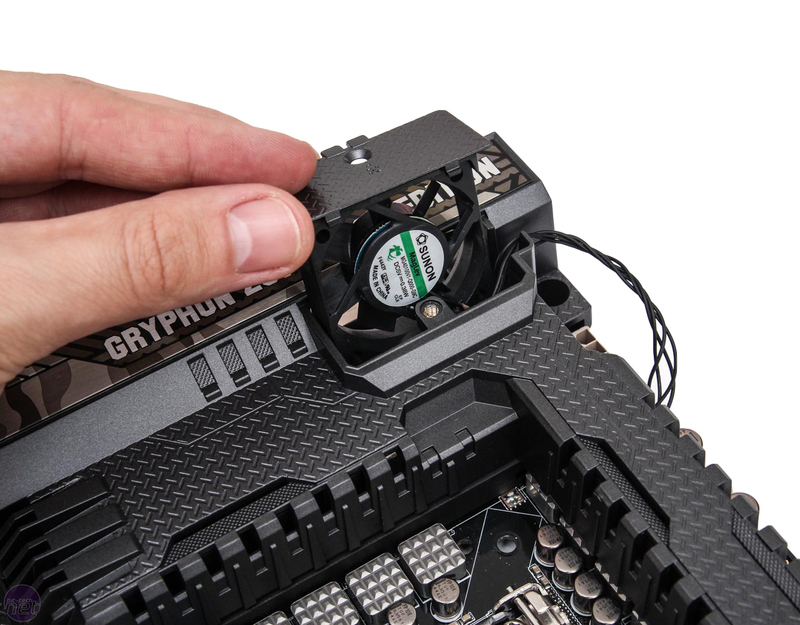 If anything, the Gryphon Z97 Armor Edition that we're looking at today has even more features to tweak than its ROG cousins - certainly if you're into fan controllers, cooling and keeping your PC running smoothly. 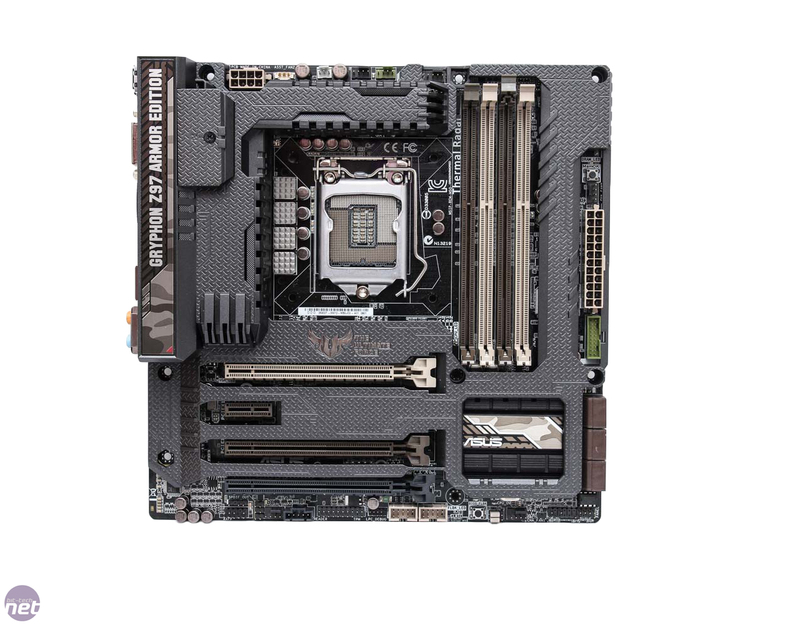 The model we're looking at today is one of two Gryphons available, at least according to ASUS's website - with this Armor Edition including the plastic shroud that sits atop the PCB. This has been included for a couple of generations of TUF boards, but the other model omits it from the box, as does one of the new Sabertooth variants. 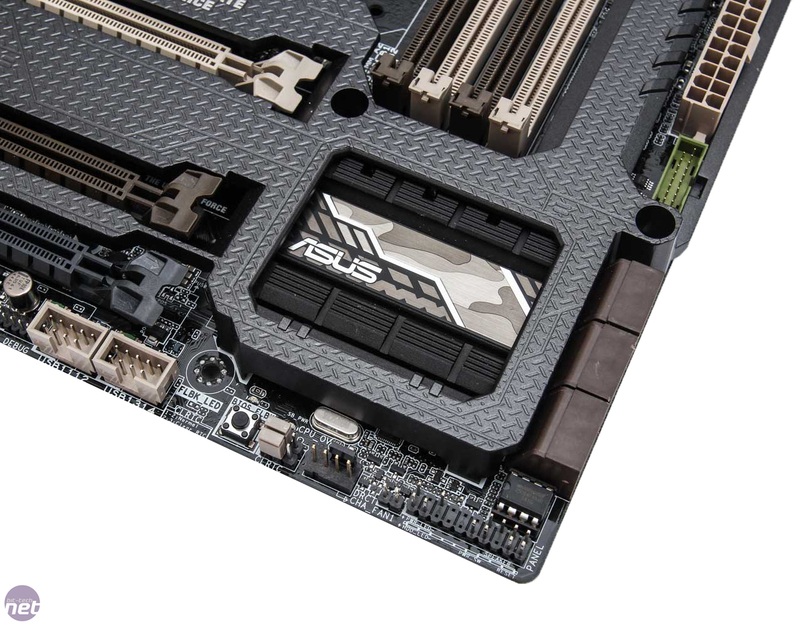 This does make sense; while the shroud was always removeable, plenty of people dislike it, even though ASUS has continually proclaimed its benefits. 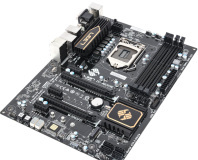 That said, we've seen an increasing number of PC modders use the board as it allows them to spray the motherboard without coating the actual PCB. 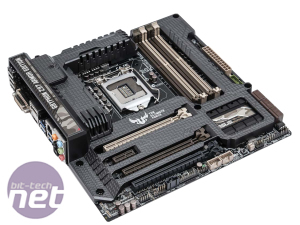 As you've probably spotted, like the original Gryphon introduced on Z87 last year, the Gryphon Z97 is a micro-ATX board - essentially the ROG Gene equivalent of the TUF series. 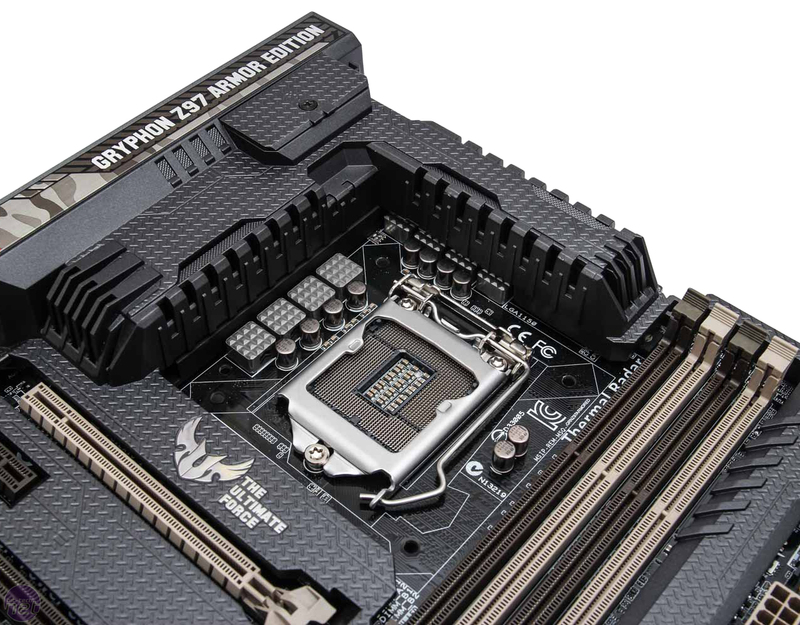 However, unlike most of the Z97 ROG boards, the Gryphon Z97 does lack a few premium features you might expect given its price tag. 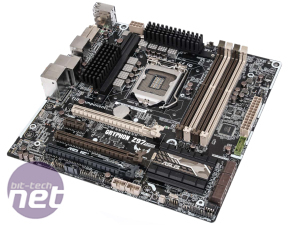 Audio is your basic on-board Realtek ALC892 and there's no M.2 port or SATA Express support - things that are included with cheaper rivals. However, that's pretty much where the disappointments end as the box is bulging with numerous bits in addition to those already soldered onto the motherboard. 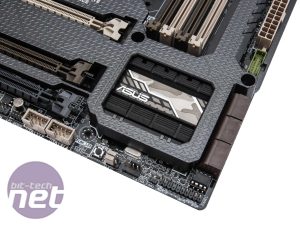 There are 10K ti-Caps, new alloy chokes, low RDS MOSFETS and an extensive complement of electrostatic discharge guards plus ASUS claims to have put its TUF boards through server-grade tests. There's an 8+2 Phase power design plus some fairly extensive heat pipe-bolstered heatsinks cooling the VRMs too. 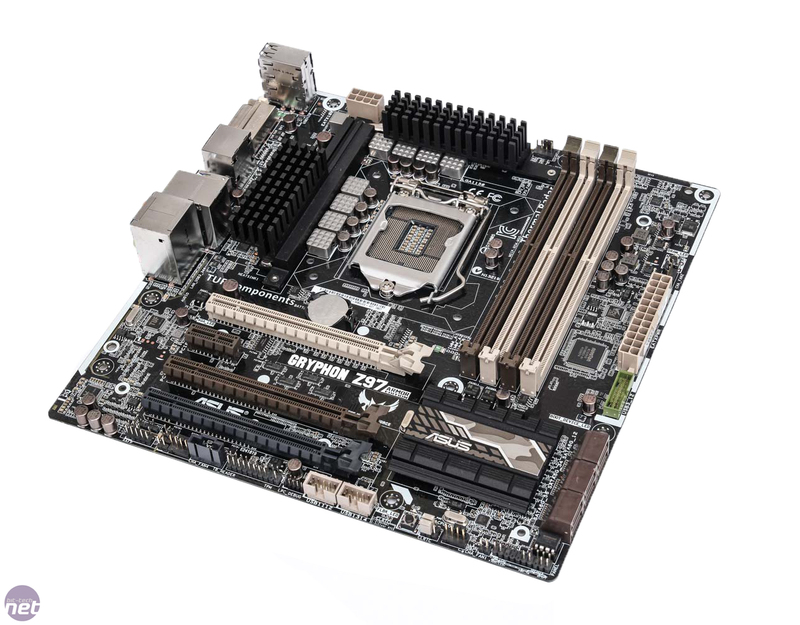 It's not an unattractive motherboard, although we do feel ASUS needs to liven things up a little. 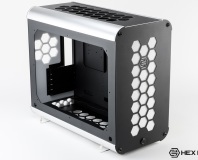 Yes, this is aimed at those that prefer tinkering and stability to raw speed and overclocking, but the beige/brown/black colour scheme of the TUF series is getting a little long in the tooth. Hey, even Noctua has ditched beige from its fans, which says something. 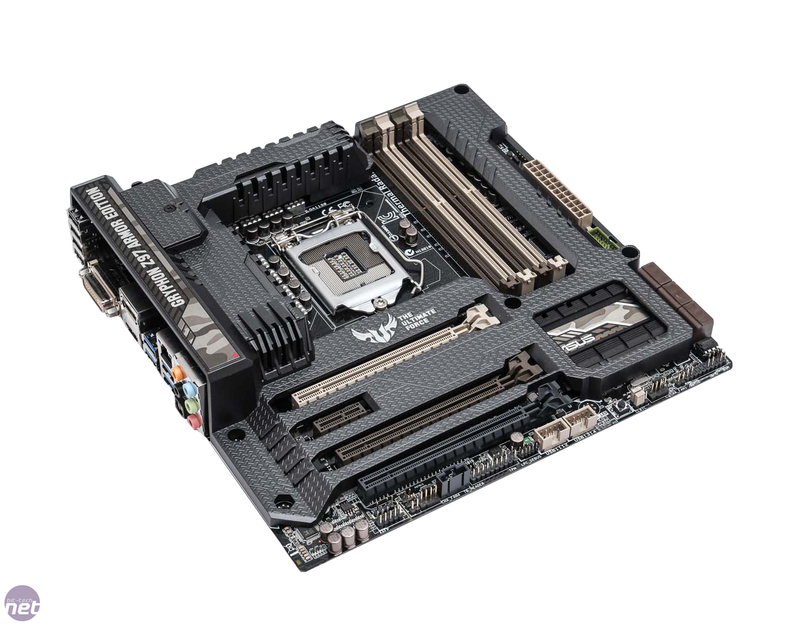 The basic specification, as we've already eluded to, isn't jaw-dropping and there's only a basic six SATA 6Gbps ports, plus the usual on-board headers. 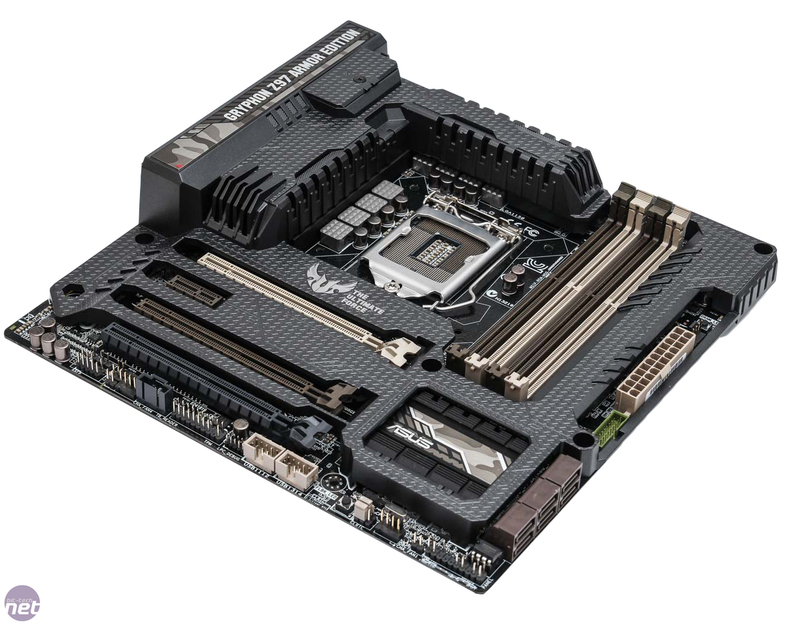 ASUS has opted for three 16x PCI-E slots (the top two can run at x8/x8 in two-way graphics setups or the top alone at x16), with the lower slot limited to x4 speed. However, there's also a single 1x slot below the primary graphics slot. 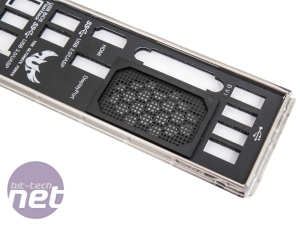 This it a bit of an awkward place for it too, as dual-slot graphics cards could get very close, even to small sound cards. 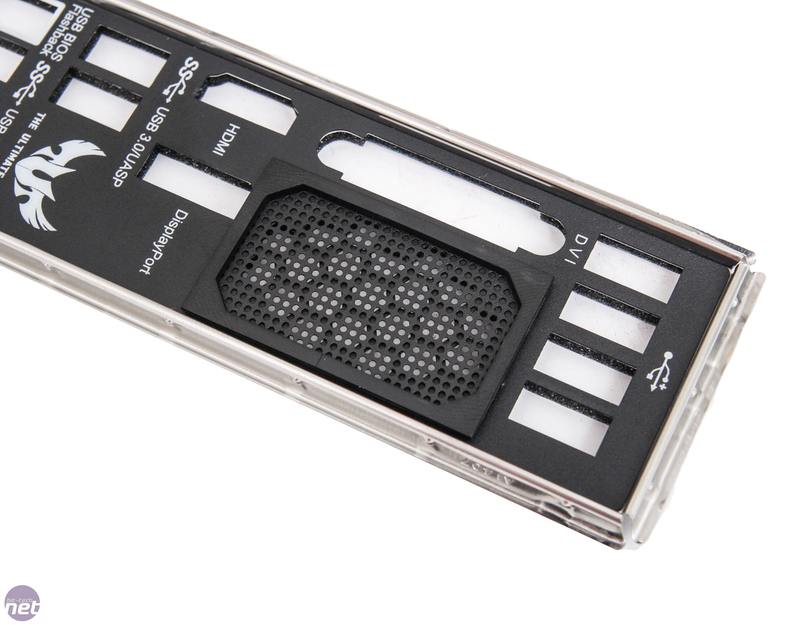 As such, you might be best advised to locate any additional expansion cards in the bottom slot. 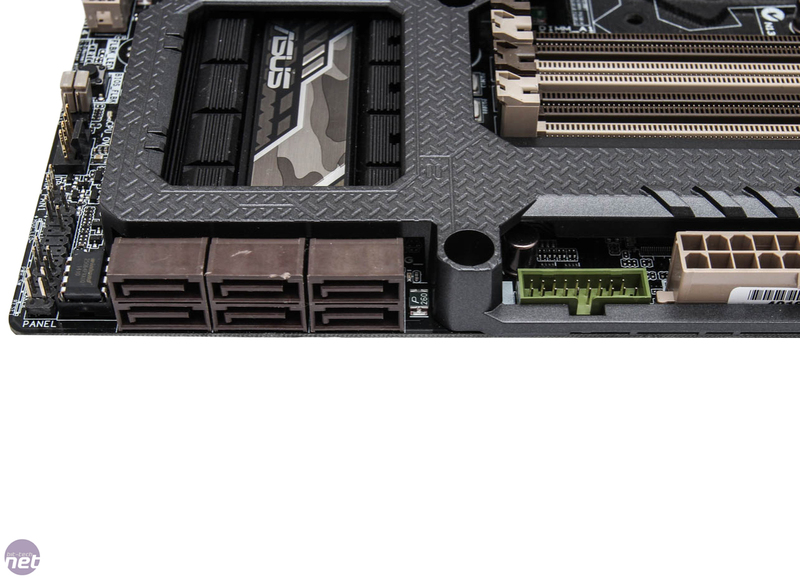 Layout is otherwise excellent, although ASUS has kind of been forced into locating the major connectors at the edge of the PCB because of the Thermal Armor. No complaints from us here, and we can't see any issues regarding the layout. So, now on to all those extra features. To start with, there's a plethora of plastic bits in the box. 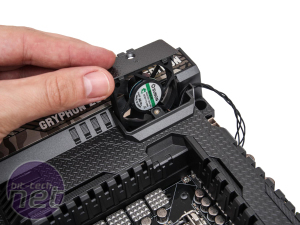 There are blanking plates for all the major headers and ports that serve to protect against dust and these extend to the rear I/O panel too, which itself has a small dust filter. 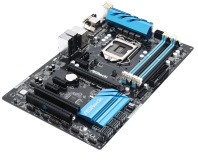 These even extend to the SATA ports and DIMM slots, so kitted out completely with the armour on too, the board looks like something out of a Batman movie. 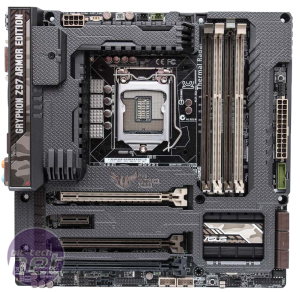 As per usual with TUF boards, there's an optional fan that connects to a proprietary header on the motherboard, and serves to draw air in through the vent in the I/O panel and through the Thermal Armor, cooling the heatinks. 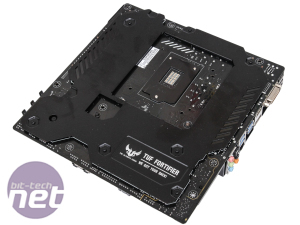 Of course if you don't want all the faff, then the Thermal Armor is removable by unscrewing the rear plate and lifting them both off, revealing the naked PCB underneath. Also in the box are three thermal sensor cables that attach to the PCB to allow you to tie in case temperatures to the Thermal Radar software, or indeed your own coolant probes.